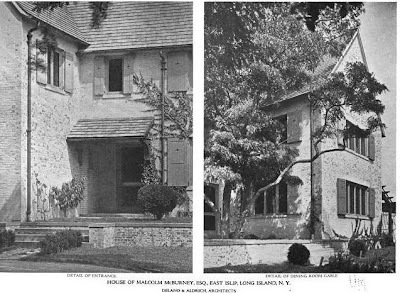 The Malcolm McBurney residence, designed by Delano & Aldrich c. 1915 in East Islip. McBurney was the son of the prominent Dr. Charles McBurney and himself a doctor. He played and won numerous golf championships in the Berkshires in the first decade of the 20th century (his family was from Mass.). The house burned down in the 1970s. 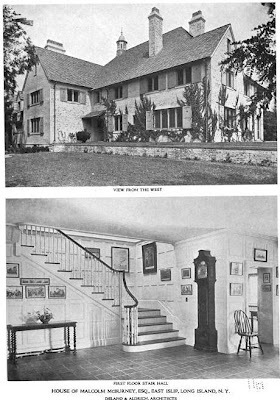 Pictures from Architectural Forum, 1918. McBurney married Helen Dorothy Moran in 1912, two years after they announced their engagement. (After his death in 1925, Dorothy married Daniel Raymond Noyes.) The McBurneys had one child, Bridget, who married Charles S Sargent Jr, a grandson of Charles Sprague Sargent, first director of the Arnold Arboretum. Charles Sprague Sargent was also the father of Andrew Robeson Sargent and father-in-law of Guy Lowell, both of whom did plenty of work on the North Shore. Thanks. 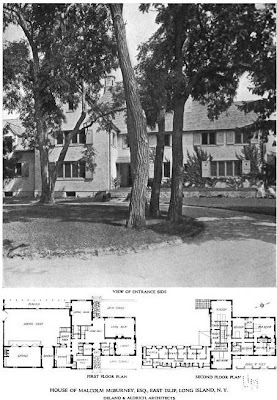 Odd that the SPLIA book and the Pennoyer book on D&A both list the house as extant. Great looking house,great plan, all of it simple and honest. And someone was a great picture hanger- love the hall!